disclaimer: I was a guest at the dinner. I feel like I start an awful lot of blog posts off with “XYZ has been on my to-do list for ages”. It makes me sound like I never get out and that I’m always a mile behind all the latest places to go. The fact is that I should be confessing that I am pretty lazy and inclined to put off visiting places that require a bit of logistical forethought. And anywhere in North Adelaide almost always falls into this category because the parking can be horrendous. I do have a couple of secret squirrel parking spots, but I’m not divulging them here. So while it’s true that the Curious Squire has been outstanding on ‘the list’ for quite a while I don’t have a good reason for not having been there. And when I was invited along to the new menu launch I was very keen to go. The Curious Squire sits on the corner of O’Connell Street and Brougham Place, in the large space that was once occupied by the original Cibo (and then Sparrow). It’s a generous space, with an outdoor area and, in its current format, is unrecognisable from the Cibo days (the last time I was there!). While the Curious Squire opened in late 2012 and has always had an American themed menu, it was only a few months ago that it welcomed a new head chef, bona fide American Drew Akin. Drew comes from Birmingham, Alabama and has overhauled the menu into an intensely personal and faithful representation of the food of the deep south. So faithful that the Curious Squire’s courtyard is now home to Gertrude, a one tonne Yoder smoker that was specially imported. Our meal started off with chit chat and beers, iced tea or lemonade (nothing fizzy – house Omade from lemon juice and a simple syrup). The lemonade was amazing and while I’m not sure if it’s a regular on the menu, I recommend trying it if you spot it. For the record, the beer focus is James Squire (surely the clue there is in the name) and the wine list is short but solid, with all wines available by the glass. Then the food started coming out. We knew the kitchen was showcasing its wares but my, we had no idea exactly how much food would be coming out. The trio of dips, served with corn chips, was first cab off the rank. Of the three (spinach and artichoke, queso and tomato salsa) the queso was, for me, the definite winner. Topped with some candied chilli, it was a soft, warm oozy cheese, sitting somewhere between fondue and cheese toastie. My focus on the dips was very quickly stolen by the chicken ‘buffalo’ wings, doused in a hot sauce and served with ranch dressing on the side. Oh my goodness – these were delicious. 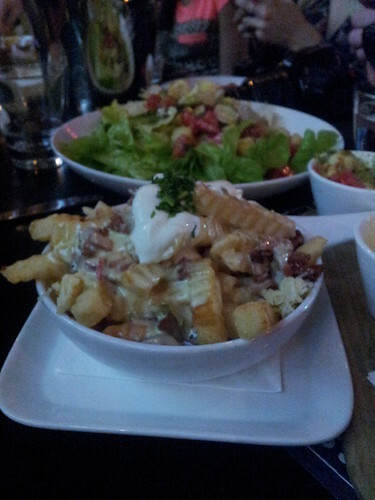 I ate a truckload of them, completely unmindful of the fact that even more food was yet to come. I love spicy food and while I have no doubt that some people may find these too hot or too messy, they were the perfect thing to eat on a cold night. While I was packing away chicken wings, the cheesy chips were brought to the table. I wasn’t really that bothered by these (there were still chicken wings to eat, ok?!) but around me it seemed that most people had just discovered the best thing since sliced bread. 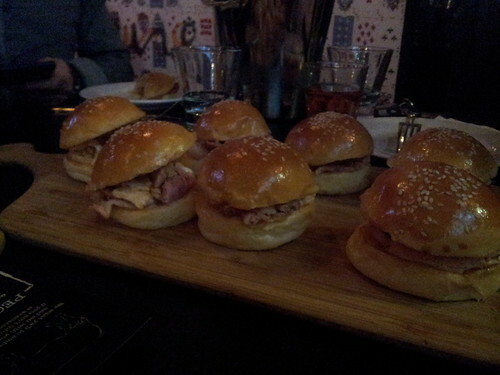 After this we moved on to a succession of sliders – pulled pork, smoked chicken and Texas style brisket. These were all distinctly different and are available as individual meats, burgers/sandwiches or as a trio of sliders. By this point, the staff could see that the pace of eating was slowing considerably and so gave us the option of trying some of all of the meats or just the pork ribs. Thankfully, sanity prevailed and just the pork ribs came out with a platter of all the sides that the Curious Squire offers, as well as some still warm cheddar and garlic biscuits (that’s scones). The sides seemed to really split the people around me. My favourite was easily the collard greens while the baked beans I found too sweet. Yet opposite me, the feeling was that the baked beans were the best thing on the plate with the candied sweet potato a very strong contender. Drew explained to us that the ideal rib in the American south is NOT a soft, fall off the bone event (you’d be disqualified if you served that up at a bbq competition) but is rather something with some texture and chew to it – think baked ham. Because the rib is more highly prized than the belly the butchery of the pig is also somewhat different and so Drew has worked with his supplier to ensure that his ribs are delivered with that bit of belly meat attached. The meat was amazing – easy to handle and delicious. And while it was not falling off the bone, it was tender. The Curious Squire will dress you up with an enormous bib but, to be honest, I didn’t find them messy to eat at all. The meal wrapped up with some peanut butter pie which somehow I managed to eat about half of, despite not being a fan of peanuts and being full to bursting. Even the non sweet tooths at the table were impressed by this. We finished the evening with a quick visit to Gertrude before heading off, not really needing to eat for another week. I left incredibly full and impressed. Drew’s enthusiasm for his food really shines through. Every dish on the menu has a a story – from the jerk chicken he learnt on a beach while on holiday through to the peanut butter pie which is his grandma’s recipe. As far as I’m concerned, I’d head back in a heart beat and would need nothing else to eat than the wings and ribs (which, happily, are available on the menu in concert in a Yoder platter, ideal for sharing). While this might not be every day food, it is fun food well done. If you’re looking for a casual meal I would definitely recommend The Curious Squire. While the team did a brilliant job of catering for a vegan at the dinner, the menu is very meat focussed so head along with a group of protein seeking friends who perhaps don’t mind getting a little messy. And … try the wings. If you head in before a football game you can buy them for just 50c a pop!